Dr. John Mangoni is on a mission to rescue moms and dads from the pitfalls of parenting. Wise in the ways of parenting and pediatrics, Dr. Mangoni speaks candidly in an unprecedented no holds barred manner taking on fifteen subjects in concise chapters. He also deals out age-old wisdoms such as the best formula for good health, family communication, how to interact with your child’s doctor and parental role modeling to more contemporary topics such as discussions on the epidemic of childhood obesity, divorce, substance abuse, child safety, adoption, and the shocking downside to home-schooling. 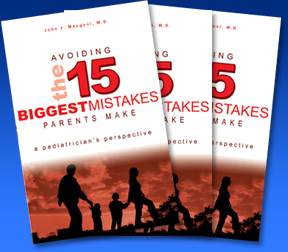 After seeing good parents make the same mistakes time and time again, Dr. John Mangoni, a pediatrician for over thirty years wanted to help parents avoid serious medical and psychological problems that could affect their children. Conversely, he has also witnessed, tested, and learned what has worked for parents and their children. This artful, informative and at times provocative parenting guide helps lay the foundation for healthy, proactive parenting. Thus, the smart parent becomes even better equipped to handle the dangers and difficulties of raising children in the twenty-first century. Dr. Mangoni loosens the hold of hyper-parenting and initiates upfront and candid discussions in this remarkable book that no parent or future parent should be without.